This entry was posted on November 28, 2018 by Zoe Thomas. We've put together a list of our top recommended gifts for students, homeworkers, budding novelists, entrepreneurs, freelancers and anybody else who uses a computer. When your job, hobby, or studies require you to be sitting at a computer for long stints, it's very important to be set up well, with good positioning, lighting and frequent movement breaks. If you slump or sit for hours on end without doing these things then you leave yourself open to developing painful, productivity-draining musculoskeletal disorders. Not what you want when you're trying to achieve your life's goals. All of our Christmas gift ideas this year are designed to prevent health problems related to long-term computer use. What better Christmas present could there be? Apart from a sports car perhaps, or a puppy. Just make sure you order by 11 am on Wednesday 19 December to have them delivered on Friday 21 (stock items only) - just enough time to wrap them up and stash them beneath the tree before Christmas Day. Remember the film Jingle All The Way, where Arnold Schwarznegger's son and every other child in New York wants a Turbo Man toy for Christmas? Well, some might say Opløft is this year's Turbo Man. At least for anyone who's fed up of sitting at a computer all day. A sit-stand platform that's half the weight of its rivals, Opløft is perfectly suited to students, freelancers and homeworkers who want to be able to stand up to work, without having to completely redesign their workspaces. Simply pick it up and place it on the surface you want to work on, whether it's your desk, or your dining room table. Rise it smoothly to the standing height you want using the levers, and push down to a flat position when you you feel like sitting. It's large enough for a monitor/laptop and all your accessories - but small enough to store neatly away behind a sofa, or against a wall when you're done. Why does everyone want one? Not only is it less bulky and easier to move about than other sit-stand platforms, but it's also a lot nicer to look at and extremely home-office-friendly. Ideally, laptops should be used with some kind of raiser or stand so that you can work with your screen at eye-level (to avoid dreaded tech neck from your head hanging forwards). 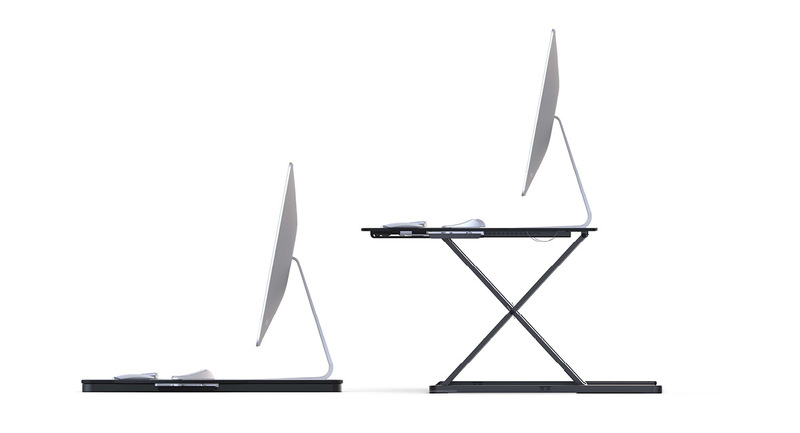 Of all the stands we supply, our favourite is the Slim Cool Laptop Stand. Not only does it raise your laptop to a comfortable position, but it also stops it from overheating thanks to its integrated airflow system. You can take Slim Cool anywhere. All of its parts are expandable, so once you slot all the pieces back in, the main body of the stand is slim and compact enough to slide into your bag beside your laptop without adding any noticeable bulk or weight at all. Easy to use, and well made for long-lasting comfort, Slim Cool really is the Christmas gift that keeps on giving. If you know someone who likes to take their laptop out and about with them - perhaps on the train, or to the coffee shop, then the Microsoft Arc Mouse is the perfect accompaniment for them. Its ingenious design clicks flat when not in use, and clicks back into a palm-shaped curve when needed. The BlueTrack technology means it can be used just about anywhere - your desk, a train table, a rough wooden surface, or even your living room carpet (although we wouldn't advise that, from an ergonomics perspective). It’s compact and light enough to pop in your bag or even your pocket, and it means you no longer have to use your laptop's track pad - which can get uncomfortable after a while. Know someone who's already got a sit-stand desk? Add an extra element of healthy fun to their set-up with a MoovRite Balance Board. The domed base of this standing board allows you to rock in a side-to-side or back-and-forth motion to keep your leg muscles and core activated while you work. The healthiest way of working is to keep moving - but not only does MoovRite help maintain your physical health, it also stimulates your mind, boosts circulation and keeps the creative juices flowing. Lighting is the probably the most neglected element of office ergonomics. More important than setting up an ambient atmosphere for your work is making sure there is enough light pointing in the right direction. You want to avoid screen glare and reflections, while ensuring enough light is illuminating your desk for you to see without straining your eyes. The Amble Task Light gives you full control over the direction and intensity of your light, ranging from evenly-spread multi-purpose illumination, to light that’s brilliantly focused on one spot. It's also got a great futuristic design that'll look slick in any home office. Know someone who catches the train every day, or who's just started a job in the city? A must-have for any commuter is a good quality ergonomic laptop bag. The Belkin Suit Line Backpack offers the perfect balance between style and ergonomics. Smart, light, well-made with PU leather inserts, this backpack keeps your belongings organised while distributing the weight evenly between your shoulders to avoid back pain. Tablets are increasingly being used as secondary screens in computer set-ups. A stand is vital if a tablet is being used for extended amounts of time as it brings the device up to eye-level to avoid tech neck. Use Tabetha on public transport on-the-go, use in the kitchen to browse recipes while cooking, or integrate it into your current desk set-up alongside your primary screens for greater work productivity. As far as computer keyboards go, the Penclic KB3 Mini Keyboard is a looker. With its statement red return key and rounded, low-profile design in glossy aluminium, it not only looks great but it's also highly satisfying and clicky to use. It's easily slotted into a laptop bag for lightweight transportation. Just connect via Bluetooth to your laptop and type away to your heart's content. Not only is the Penguin mouse an award-winning ergonomic design famed for its comfort and ingenuity, but it also looks like an actual penguin - complete with a bow tie that functions as a switch between right and left-hand use. If you know someone who struggles with RSI or other computer-aggravated disorders, the Penguin could be their new best friend for 2019. Most of us have, or know someone who has, suffered with back pain. Helpful during times of acute back pain, herniated disc, sciatica and lumbago, the Disc'o'Sit can be placed on any seat to engage the core and activate supporting muscles. The idea is that it improves posture and relieves prolonged stress on the lower back. It's inflatable and doubles up as a standing board, perfect for active workers. We hope you liked our gift idea selection for Christmas 2018. Remember, you must order before Wednesday 19 December to ensure delivery before Christmas, and that's only on items with a 3-4 day lead time (all of the above included). The Posturite office is closing down for festivities on Friday 21 December at 5 pm, reopening again at 9 am on Wednesday 2 January 2019. Happy Christmas from all of us at Posturite!